Location: located on the beach at Miramar’s Half Moon Bay, it is an open-plan restaurant with windows overlooking the ocean and beach. Call ahead to reserve a view of the Bay. While eating we saw whales, dolphins, sailboats, and a lovely view of the beach. There is also a heated outside seating area, but the water view is hidden by a fence. Live music is audible throughout, but is only loud at the bar. The service was good. Car parking service was included, but the atmosphere was family oriented rather than black-tie. Everyone was prompt and friendly. The food: My husband had the garlic cheese-bread for appetizer. Served on a plate with a marinara sauce, it was ordinary but tasty. For main course, he had the Seafood Paella. Lovely! Consisting of a succulent yellow rice, a delicious (slightly bitter from turmeric, just enough to offset the seafood) sauce, and assorted seafood (pacific prawn, clam, mussel, Scottish salmon, Chorizo – and, oddly enough, chicken). The prawns were very well cooked: succulent, and not rubbery. The mussels and clams were also very well prepared. The chorizo was also very good. The salmon was nice and tender, but the subtle flavors of the salmon were somewhat overwhelmed by the turmeric. The chicken was little more than filler – it really wasn’t necessary, and didn’t “fit” with the rest of the meal. Despite this, the Paella was excellent – highly recommended. My fish ‘n’ chips were tasty and fresh. As a world-wide seeker of fish ‘n’ chips, I can say these were top-notch. The batter was lovely! Others at our table had Eggs Benedict (which was good, but is hard to ruin), Crab & Shrimp Linguine (which looked wonderful) and Lobster Alfredo (also looked great). Keep an eye out and a camera handy. 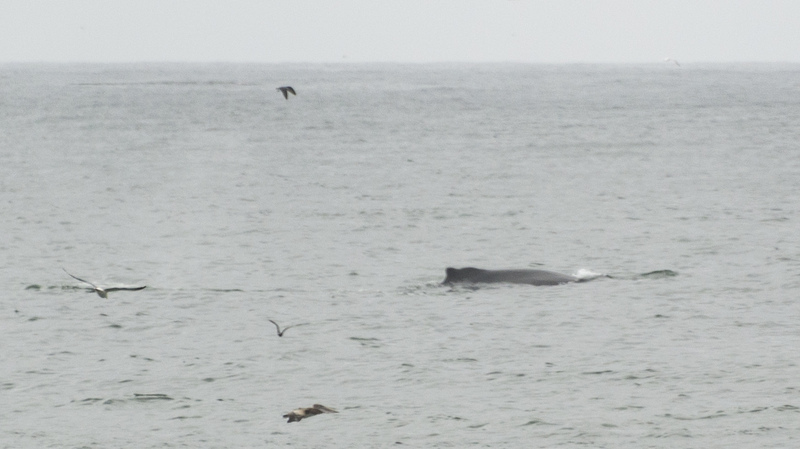 This image of whales was taken through the restaurant window with a 300 zoom lens at max zoom. You may want to take a longer lens, if that’s your reason for going. Miramar Beach itself is just across the road from the restaurant. A nice sandy beach just a short drive from larger towns makes this a great place for a day trip with the family, or the family dog. Finding parking will be your biggest problem.